My family can’t live a day without bread. Except I have been addicted to making tangzhong breads for my family, recently I make more Chinese steamed buns as they can be kept in freezer for two weeks or so. Whenever I need them, just grab a few of them straight from the freezer and pop them in the wok to steam or pan fry, then enjoy fresh and hot buns after ten minutes or so. 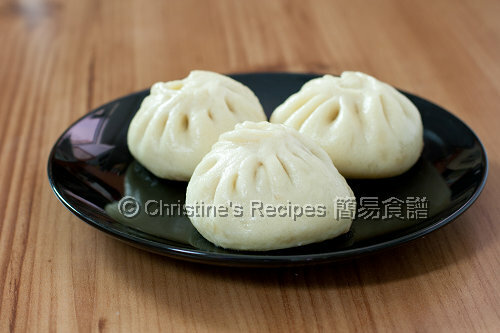 After posting the pork bun recipe, I was asked by my fans on how to pleat Chinese buns. Last week, when I made some buns again, I took a short video when I pinched a Chinese bun. No tricks at all. It’s very simple, just needs some practice and you’d find great satisfaction in the process of pleating buns. Practice makes things perfect. A side note, I’m just an amateur and start learning how to take videos for blogging. Please pardon me that the video looks a bit dark. Yet, the whole process of how to go about pinching a bun is shown clearly. Hope you all find it helpful and like it. Place a spoonful of fillings in the middle of dough wrapper. Use one hand (I accustom to use my left hand.) to secure it with your thumb pressing the filling lightly. Use another hand, with your thumb and first index finger to pull up a little portion of the side of the dough. Fold and pleat evenly all the way as you go anticlockwise until you reach the end, enclose the bun. You’ll get a nice swirl pattern. It might be a bit difficult to pleat perfect buns at the first attempt. After a few tries, you’ll find the pleating is not that difficult as you thought, and you'd get nice looking buns. You make it seem so simple! The last time I made baos, my baos looked like a joke. Thank you for showing how to do it through the video - now I'm excited to try making baos again! You are making me tempting to make bao! Thanks for sharing. Nice video show. You make it look so easy and neat! Like the bun :) I can eat at least THREE! Sure like!! I like the video, I like the post and I like your blog too (as always)! Thanks for sharing such a great tip! Love the video- Thanks! I've made chinese buns before but had no idea how to wrap! Simple and pretty. Thanks for the vid! Wow! You make it look so easy. It's a perfect wrapping I will try it. Love your blog Christine. Thank you for the awesome video & teaching us the wrapping! you're a professional! thanks for showing us this video! Your tutorial is clear enough : )! I have a box of pao flour sitting in the pantry calling my name. After seeing your post and video, I have got to get to it. Thanks for the effort to make this video. Thanks for sharing this video. Pau pleating is therapeutic and helps to destress! Great video and I've always wanted to make perfect fluffy buns like these look. Gong xi fa cai! I am 100% doing this. Fantastic tutorial - I've always wanted to learn this! And yes - I like the little bao! AWSOME! Thanks for the Great Video, You've done yourself proud! Well done! I look forward to seeing more of your talented cooking hands. hmmm I can't seem to get it down. my dough just lumps together when I try to fold it and it would end up looking like a char siu bao. How do you manage to get the skin looking like a wonton skin? I kneaded the dough until smooth and non-stick to my hands. Then roll it flat with a rolling pin. hi christine...would be nice if you will also have a recipe for this dough...for steamed bun..=)thank you for all your awesome recipe and tutorial!!!! Yeah, got the steamed bun recipe using this tutorial here. Was so impressed ... really inspire me to try making it ..also looking high and low for videos on how to fold WONTONS like a professional ... so great for presentation - can you teach that too please? Thank you again - regards from Australia! Thanks for your love of this tutorial. You might like to browse through my channel on youtubee. I've already posted several videos to show how to wrap wontons and dumplings. I often cook them first, then freeze them. When I need them, just steam and reheat them. You can use the same amount of Hong Kong flour instead.